The 33rd National Games were declared open by UPA Chairperson Sonia Gandhi at a spectacular opening ceremony here today. Mrs Gandhi also released the official games souvenir and later met some of the athletes. The Nagpur police today failed to throw more light on the mysterious name of ‘Robin Singh’ which had figured in the taped conversations between West Indian all-rounder Marlon Samuels and alleged bookie Mukesh Kochar. Paul Collingwood hit a superb century to guide England to a nail-biting four-wicket victory over Australia in the first tri-series final at the Melbourne Cricket Ground today. South African Andrew Hall took four wickets to restrict Pakistan to a mediocre score in the rain-affected third one-day international here today. Pakistan hit 245 for eight after winning the toss and choosing to bat. Rain interrupted play after 47 overs and again at the end the innings with one ball left unbowled. Did Viru, Greg play bad ball? Though the BCCI smiled on the Cricket Association of Bengal after 14 months and gave an international match to the Kolkatans, the gods were still not happy for some reason and so denied them a glimpse of the batting of not only their favourite, Sourav Ganguly, but also Sachin Tendulkar, Rahul Dravid and perhaps Virender Sehwag. Nimbus Communications today filed a petition before the Bench of Chief Justice M.K. Sharma challenging the Sports Broadcasting (Mandatory Sharing with Prasar Bharati) Ordinance, 2007, as “bad in law.” The matter will come up for hearing on February 12. India were staring at another relegation after their second string squad conceded a 2-0 lead to hosts Uzbekistan in the Davis Cup Asia-Oceania Group 1 first round tie here today. Jeev Milkha Singh’s second successive card of one-under 71 was the only highlight of an otherwise gloomy day for the Indians on which Shiv Kapur and Jyoti Randhawa looked certain to miss the halfway cut before lightning stopped play in the second round of the $1.3 million Maybank Malaysian Open here. National champion Subhajit Saha scripted a major upset, shocking third seed Thiago Monteiro of Brazil to advance to the quarterfinals of the inaugural Indian Open table tennis championship. On a fortunately bright sunny day, about 5,000 athletes from 32 teams took part in the march past. The home team had the largest contingent of 908 athletes, while Andamans had the smallest (15). 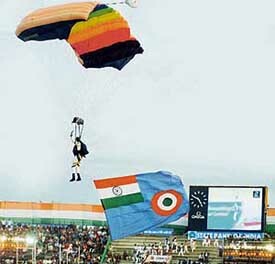 Three choppers of the Indian Air Force flew over the stadium at the beginning of the ceremony and showered rose petals. The helicopters, all MIG 17s, were from Unit 118. Nine sky-divers jumped from a height of 8,000 ft and opened their parachutes 3,000 ft from the ground. 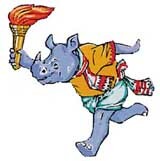 The games torch was lit by Bhogheswar Barua, a key member of the Indian athletics team of the sixties. Assam Chief Minister Tarun Gogoi, who was also the chief host, ushered in the VVIPs, including representatives from various federations and nearby states. The games are being staged at 17 venues. Altogether 3,043 medals are up for grabs - 938 gold, 958 silver and 1127 bronze. Rugby, lawn ball, wushu and karatedo will make their debut. Meanwhile, the Asom Gana Parishad (AGP) and the BJP have taken strong exception to Congress chief Sonia Gandhi inaugurating the games. In the past, the games have been inaugurated by the President, Prime Minister or the host state’s Chief Minister. “This is simply shocking and unpardonable,” said BJP state president Ramen Deka. “What stopped the Assam Government from inviting the President to declare the games open, I simply cannot understand,” he said. Earlier, there was a bomb blast on the outskirts of the city on a railway track this morning, but it had no effect on the proceedings. Haryana thrashed Madhya Pradesh 10-0 in their opening match in women’s hockey at the 33rd National Games today. Jasjeet Kaur and Surender Kaur found the target three times each as the Haryana girls ran over their opponents at the Maulana Mohd Tayabullah Hockey Stadium at Bhetapara. Jasjeet (second, 31st and 42nd minutes), Surender (15th, 19th, 30th), Rani Devi (37th, 47th), Ritu Rani (60th) and Simarjeet (67th) were the scorers. Delhi comprehensively beat hosts Assam 4-0 in a Group B match with Prem (11th and 20th) and Meenu (23rd and 38th) scoring twice each. Uttar Pradesh were on song as they beat Jharkhand 6-0 in another Group B encounter. Maharashtra beat Orissa by a solitary goal in a Group A match. Punjab defeated Meghalaya 2-1 in a Group B men’s football match at the North-Frontier Railway Sports Complex in Maligaon today to secure three points. The northeastern state has been included in the competition after Goa pulled out. In a Group A match, hosts Assam beat Maharashtra 4-0 at the Nehru Stadium. The hosts scored twice in each half of the first-round encounter to beat the 1999 finalists. The football teams have been divided into two groups with four teams each, with the top two from each group making it to the semifinals. As speculation continued on who could be the person referred to during the conversation, the city Police Commissioner SPS Yadav declined to comment on it. “I can’t comment on it,” Yadav told PTI here. Yadav said police were not sure whether Samuels and Kochar in their conversation was referring to “Robin Singh or Robinson”. “Although the name figured, it was difficult to identify the right player or person (Robin Singh or Robinson),” he said. Dubai: Mukesh Kochar, who finds himself at the centre of a potential match-fixing scandal for extracting information on team composition from West Indian cricketer Marlon Samuels, today strongly denied that he was a bookie and said he was willing to cooperate in the investigations. Describing himself as a “plain cricket lover”, Kochar said he was a businessman by profession and had known Samuels as a friend for a long time.“I am not a bookie but a plain lover of the game. The allegations of match-fixing are baseless. I have known Samuels only as a friend. He is like a son,” Kochar said. New Delhi: The beleaguered West Indian all-rounder Marlon Samuels today found support from his captain Brian Lara who said the entire team was behind him in this hour of crisis. Lara said he was unable to contact Samuels till now but wanted him to know that he had the full support of the entire team. “I have been unable to contact the WICB or more importantly Marlon Samuels as the report emerged while I was in London overnight,” Lara was quoted as saying by NDTV. Port-of-Spain: The West Indies Cricket Board was still awaiting an official communication from the ICC or BCCI on Marlon Samuels’ alleged links with an Indian bookie in Nagpur. The West Indies Cricket Board Acting Chief (Cricket Operations), Tony Howard, said they could not do anything until it got official word from either the Board of Control for Cricket in India (BCCI) or the ICC in the matter. Rajkot: The ICC’s Anti Corruption Unit representative in India N.S. Virk is reaching here tomorrow to keep a “strict vigil” on the home team’s second cricket one-dayer against Sri Lanka on Sunday. After Australia had slipped from a promising 170-1 to 252 all out, England recovered from 15-3 to win with three balls to spare and take a 1-0 lead in the best-of-three final. The second final is in Sydney on Sunday and the Englishmen are just one win away from a fairytale end to an horrific tour that saw them lose the Ashes 0-5. Collingwood, who also took a superb catch and two run- outs, struck the winning runs to finish on 120 not out as England recorded their second straight victory over the world champions. Brett Lee picked up openers Mal Loye (0) and Ed Joyce (6) and Nathan Bracken trapped Andrew Strauss for a duck as England made a poor start to their reply but a controlled stand of 133 between Ian Bell (65) and Collingwood set them on their way. When Lee bowled Bell, Collingwood then added 74 with Andrew Flintoff (35) before it fell to a nail-biting run chase at the death. Needing 25 off the last three overs, Collingwood hit two superb fours off Shane Watson, and he and Paul Nixon reduced the target to four runs off the last over. The Durham batsman, who scored his second straight century, punched the air with delight as he steered Nathan Bracken through midwicket for the winning run. After winning the toss, Australian skipper Ricky Ponting hit 75 and added 138 for the second wicket with Matthew Hayden (82) to put the hosts on target for a total in excess of 300. However, some tight bowling and fine fielding by England put the brakes on the middle order as the hosts stumbled from 170-1 to their modest finishing total of 252 all out in 48.3 overs. After losing Adam Gilchrist for five, Ponting’s fluent 75-ball knock was ended by a brilliant diving catch by Collingwood at cover off Monty Panesar. Hayden went next over when Sajid Mahmood collected a steepling catch at long-on off Jamie Dalrymple, and Brad Hodge was trapped leg before for five by Panesar to make it 196-4. Australia then lost Michael Clarke (33) to a Collingwood direct hit and Mike Hussey (17), caught behind off Flintoff, in consecutive balls. 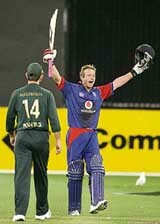 Watson (9) holed out off Mahmood to Bell at mid-wicket and Flintoff, who finished with 3-41, wrapped up the innings when he bowled Glenn McGrath for a duck. Fall of wickets: 1-32, 2-170, 3-180, 4-196, 5-229, 6-229, 7-248, 8-248, 9-250. Bowling: Plunkett 10-0-56-0, Mahmood 8-0-45-2, Flintoff 9.3-1-41-3, Panesar 10-0-44-2, Collingwood 4-0-21-0, Dalrymple 7-0-41-1. Fall of wickets: 1-1, 2-14, 3-15, 4-148, 5-222, 6-225. Medium pacer Hall took four for 35 after replacing fast bowler Andre Nel, who was left out because of stitches in a cut on his foot. Pakistan looked on course to score a more challenging total before they slumped from 162 for four to 175 for seven in the space of 12 deliveries. Fast bowler Makhaya Ntini removed openers Imran Nazir and Kamran Akmal in quick succession as Pakistan slipped to 21 for two in the sixth over. Fall of wickets: 1-20, 2-21, 3-65, 4-71, 5-162, 6-165, 7-175, 8-216. Though the BCCI smiled on the Cricket Association of Bengal after 14 months and gave an international match to the Kolkatans, the gods were still not happy for some reason and so denied them a glimpse of the batting of not only their favourite, Sourav Ganguly, but also Sachin Tendulkar, Rahul Dravid and perhaps Virender Sehwag. It is not usual to have rain in Kolkata at this time of the year, and when it started when only 18.2 overs had been bowled, the crowd’s disappointment was obvious. Those overs were indicative of the potential of Munaf Patel, who has it in him to become a top bowler if he can stay focused and not mentally drift away. He picked up two wickets and bowled the kind of line which does not allow batsmen to get away to a flying start. Sure, when he is in the mood, there’s nothing to stop Sanath Jayasuriya, and the Sri Lankan batted with such panache that India would have been worried what he would end up with and take his team to. India had three top Lankan batsmen back in the pavilion with skipper Mahela Jayawardene still not quite back to form but Jayasuriya was still there and when he is around, anything can happen. What Munaf’s bowling has done is to give the selectors a clue as to what the bowling line-up should be, though whether to go with the extra new-ball bowler or an all-rounder is going to be the question. Ramesh Powar has dented his chances by his attitude while batting in the Ranji final and India may go in with the two spinners who have served them magnificently for the past several years, Anil Kumble and Harbhajan Singh. Now with only one game left before the announcement of the squad for the World Cup, it would be interesting to see if India play the same side for the next match and thus not expose Irfan Pathan to the Sri Lankan marauders. That may well be a good idea, for it may be in India’s interests not to have his confidence shattered on the eve of the event. With Sehwag, too, it does not matter if he scores runs or not for he is crucial to India’s chances and all that is needed is to have the skipper and a senior player put their arm around his shoulders and tell him how much they need him to fire for India to bring home the World Cup. Meanwhile, Justice B.D. Ahmed of the Delhi High Court today refused to grant conditional stay of the Ordinance. However, the court did not quash an earlier interim order directing the public broadcaster to download the signals seven minutes late. Though the Ordinance was promulgated on February 7, Nimbus did not provide live signals of the Kolkata one-dayer yesterday, sticking to the High Court order. Appearing before Justice Ahmed, who is hearing the original petition, senior counsel for Nimbus Harish Salve submitted that the signals of the free-to-air telecast on Doordarshan could be downloaded by countries such as Sri Lanka, Singapore, Malaysia, the whole of South-East Asia and West Asia causing irreparable loss to the private channel. “The Ordinance transgresses the constitutional limits and apart from violating the petitioner’s fundamental rights, it also interferes with the power of the court to review the circular enforcing the private channels to share the feed,” said the petition. Despite requests, Prasar Bharati did not fix decryption boxes in its 1,400 low-power transmission (LTP) centres, said Salve. Karan Rastogi and Vivek Shokeen, both making their debut, offered little resistance to their more seasoned opponents, Farrukh Dustov and Denis Istomin, respectively, and went down in straight sets in the zonal men’s team tennis competition. Jeev’s performance lifted him to the tied 12th spot, while other Indians slumped down the leaderboard at the Saujana Golf and Country Club. Overnight second, SSP Chowrasia was five-over on the 13th hole before the weather disrupted the proceedings. Playing his back nine first, the Kolkata caddie-turned-pro, who was in sublime touch yesterday, failed to find form today and stumbled to a 10th-hole bogey. Chowrasia never recovered from the initial setback and went on to drop a double bogey and a bogey on the next two holes before finally saving par on the 13th. But the Kolkatan dropped a shot on the very next hole to make the turn at four-over. Coming back to play his first nine, Chowrasia’s poor run continued as he bogeyed the fourth hole before play was stopped with the Kolkatan tied for the 31st position. In contrast, Jeev kept things under control and with two birdies against a bogey, the seasoned pro entered the top 20 with a total of two-under 142. Amandeep Johl, who was tied 49th with a poor 73 yesterday, was also doing reasonably well at one-under on the 12th hole for a share of the 31st spot. However, Kapur and Randhawa continued their dreadful run and after poor opening rounds of 76 and 77, respectively, yesterday, the duo was well below the projected cut mark with Kapur at one-over and Randhawa at two-over after the 14th hole. Rahil Gangjee was also not doing too well and after an opening-round 70, which took him to the tied 11th spot, the Indian slumping to five-over on the 10th hole. Pebble Beach (USA): Determined to make the most of his conditional exempt at the USPGA, Arjun Atwal braved windy conditions to card a superb five-under 67 for the tied forth spot after the opening round at the Pebble Beach National Pro-Am. The Bengal paddler dropped the first game but then fired his way to a brilliant 3-11, 11-9, 11-8, 12-10, 11-4 victory over the world No. 94 at the Indira Gandhi Indoor Stadium here.